Home Team Advantage at 40,000 ft.
For years, extensive travel across time zones has plagued sports teams around the world. Introducing the Nike Athlete’s Plane: An airborne, athlete-centric facility designed and equipped to mitigate the “away disadvantage”. Designing the Ideal “Away” Facility. Every professional team is focused on attracting the best players and getting the best performance out of those players. Modern weight rooms, better playing surfaces, and cutting-edge rehabilitation spaces all contribute to this. But something obvious is missing: investments in how professional sports team travel. 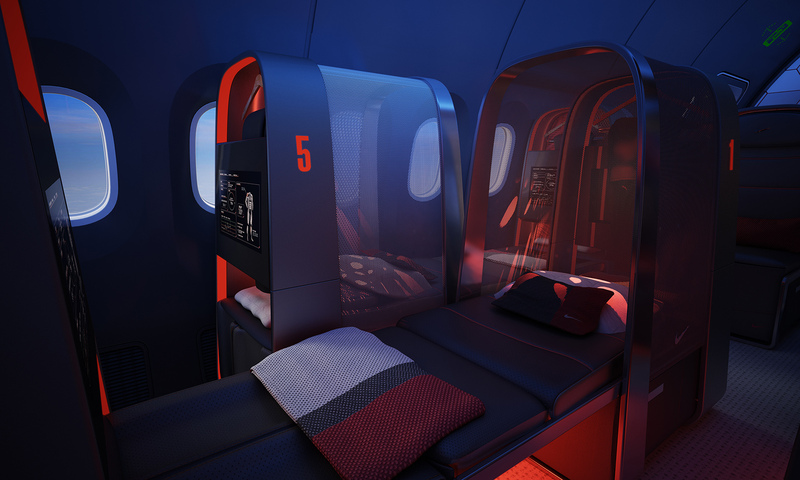 So we collaborated with other researchers, strategists, and designers at Nike to develop a highly customized Boeing 787 Dreamliner interior, crafted to cater to professional athletes during their time on the road. A focus on both mind and body. To mitigate the “away disadvantage” suffered by teams traveling long distances across numerous time zones, our researchers focused on four areas of athlete performance that aren’t addressed by the commercial charters most teams use today. Recovery areas neutralize the negative effects of air travel on the body and accelerate injury diagnosis and treatment through in-flight biometrics and analysis. Ice and compression sleeves built directly into the aircraft’s sidewall foster circulation and promote healing. 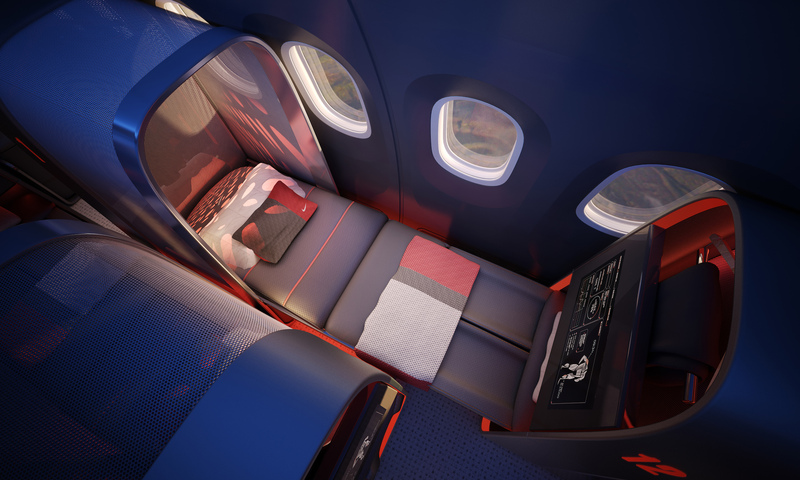 Noise-reducing technologies and lie-flat seats/beds designed for the extreme body proportions of many athletes create ideal sleeping conditions. Finally, mental preparation is supported through OLED screens and large touchscreen monitors that enable individuals and groups to review game film while in-transit. Performance innovation at 40,000 ft. In order to better understand the needs of elite athletes, we conducted interviews with team physicians, coaches, operations staff, and sleep specialists working with both collegiate and professional teams. 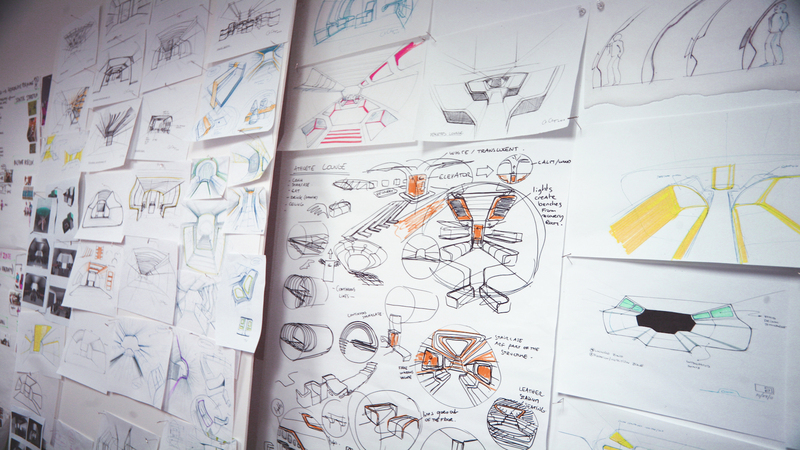 TEAGUE also worked with designers and training experts from Nike to ensure that our understanding of how to design for athletes was on track. What did we find? The need is real. Crowded game schedules and travel by flight is a fact of life for professional athletes, but it is one that comes at a price: injuries and suboptimal performance. Circulation: fostering natural mobility by building in equipment that ensures optimal circulation and promotes healing. 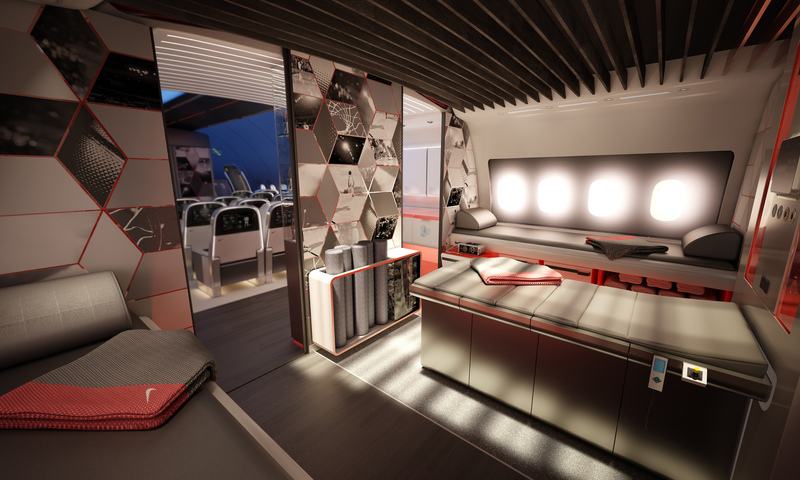 The Nike Athlete’s Plane doesn’t just cater to the professionals; team staff, including coaches, nutritionists, trainers, and more also benefit from the facilities built-in technology. Biometric monitoring urinals to gauge dehydration and biometric-monitoring apparel that downloads information at a players’ seat are a highlight of the design. Access to vital insights about their players: how much sleep they’re getting, blood work, nutrition stats, hydration levels, physical therapy stats, and more, all on a rolling basis throughout the season, are instantly accessible, both onboard and on-the-go. 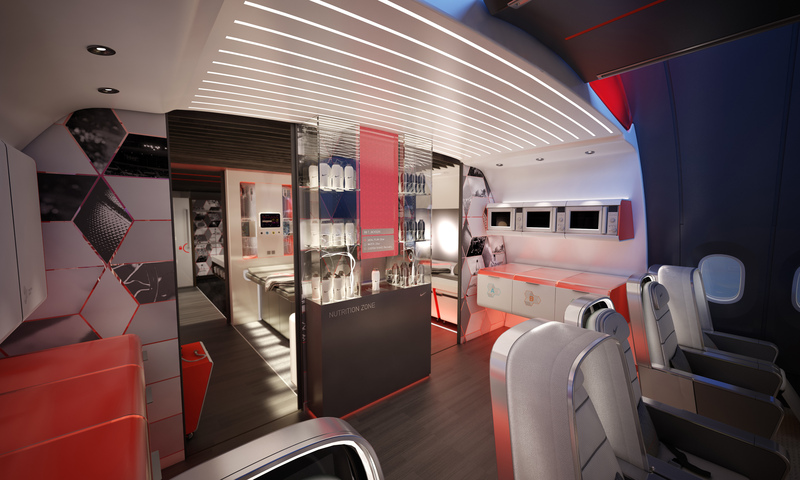 Since its debut, The Nike Athlete’s Plane concept has garnered coverage and interest from around the world, both from individual teams and entire leagues alike. 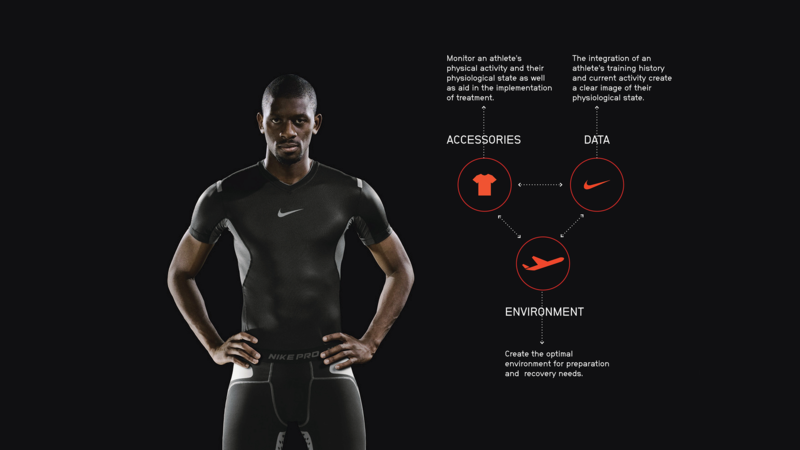 TEAGUE continues to iterate on the design as technology evolves and we learn more about the unique needs of elite athletes through our ongoing conversations. Want to learn more about the Nike Athlete's Plane? Get in touch with the team behind it at hello@teague.com.